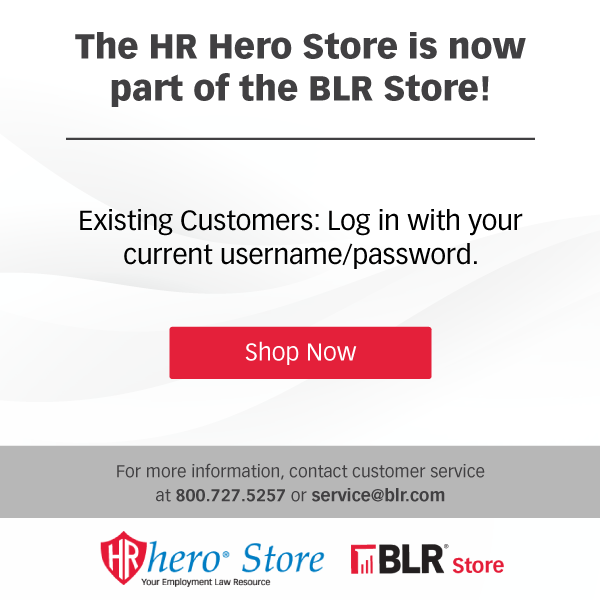 Now available through HR Hero! From preemployment arrest and conviction inquiries to final paychecks, there’s a different state law or regulation for almost every aspect of the employer-employee relationship, which can be especially confusing if you must comply with employment laws in more than one state. But that’s where the State Law Chart Builder can help! This comprehensive online information tool can save you hours of research time because the information you need is in one convenient place. Whatever the question you get from a frontline supervisor, a field office, an employee, or another executive, you’ll find the answer in seconds. Clear side-by-side comparison charts tell you in one or two sentences what your policies and practices must contain to avoid the attention of state labor department watchdogs and aggressive plaintiff’s attorneys. From Alabama to Wyoming, we’ve done the research on everything from family leave to disability accommodations to drug testing to meal and rest breaks. More than 75 areas of employee management are covered, giving you everything you need to make smart decisions and policy recommendations. Also available as part of an HR Hero subscription! Get state-specific employment law answers in just a couple of easy steps! 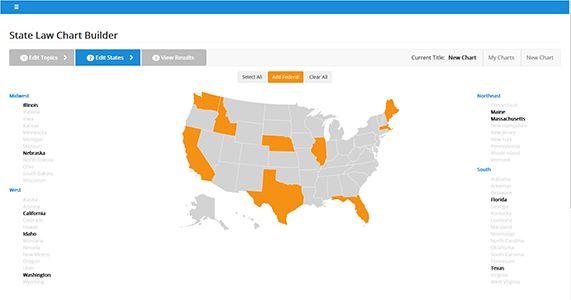 State Law Cart Builder explains HR’s state law rights and obligations in over 75 areas of employee management, and in all 50 states, with just a few mouse clicks. It’s HR’s online tool for maintaining legally safe and effective employment practices wherever you have a workforce. From pre-employment arrest and conviction inquiries to final paychecks, there’s a different state law or regulation for almost every aspect of the employer-employee relationship. 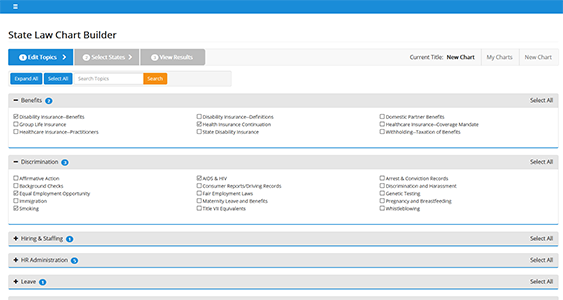 Step 2: Then, select the states in which you need to know what your policies and practices must contain. 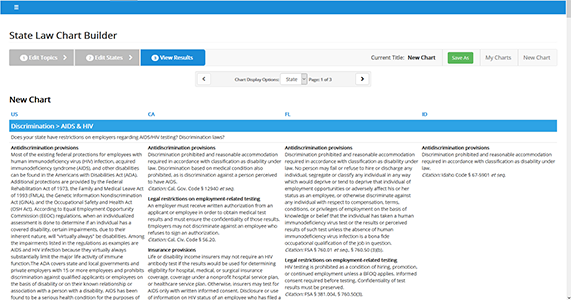 Step 3: State Law Chart Builder instantly provides a side-by-side fast-read of exactly what’s required of HR under state law, what you can demand of employees and applicants, and what’s strictly forbidden. All so you don’t risk workplace conflict, expensive fines and penalties, even lawsuits. State Law Chart Builder compares laws and regulations in every state under 75 of the most complicated and legally treacherous areas of employee management. Then, it presents simple, easy-reading summaries of what employers can and cannot do, so you can make better and more confident policy and practice decisions. 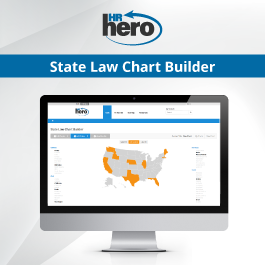 Pricing for State Law Chart Builder is for internal organizational use only for one user. For custom pricing, additional users/states or to discuss external or third party use, please contact customer service at 800-727-5257.